Bored of cereal and plain old toast? Make breakfast exciting again with one of these very tasty starts to the day. Eat breakfast like a king, lunch like a prince and dinner like a pauper – that’s the advice doled out by everyone from health gurus to our own parents. It’s certainly a good way of eating, as a larger meal in the morning will keep us fuller throughout the day and provide plenty of energy when we need it most. But it can be hard to muster the energy to cook a full dish from scratch when we’re still half asleep and have a job to get to. With a little forward planning, however, you can prepare some incredible breakfast dishes the night before and have them ready to eat the next morning in a matter of minutes. One ingredient which is almost ubiquitous at the British breakfast table is milk, whether you’re eating a quick bowl of cereal, sipping a morning coffee or preparing something a bit more ambitious. With free-from diets on the rise, more and more of us are starting to avoid it for health reasons. While the recipes below all contain milk, don’t write them off it it doesn’t agree with you – alternatives such as easy-to-digest a2 Milk can help if you’ve struggled to digest it in the past. Either way, the recipes below go way beyond dry toast or a rushed full English. With healthy bowls of grains, more indulgent combinations, international specialities and tried and tested classics, there’s plenty of inspiration to get you out of your tired morning routine and breathe new life into the most important meal of the day. In the US, a big stack of pancakes is a common sight at the breakfast table, and there’s no reason why we shouldn’t enjoy the same treat in the morning either. This recipe incorporates bananas into the mix along with milk and eggs, which makes them perfect for topping with other fruits, cream and honey for a sweet start to the day. 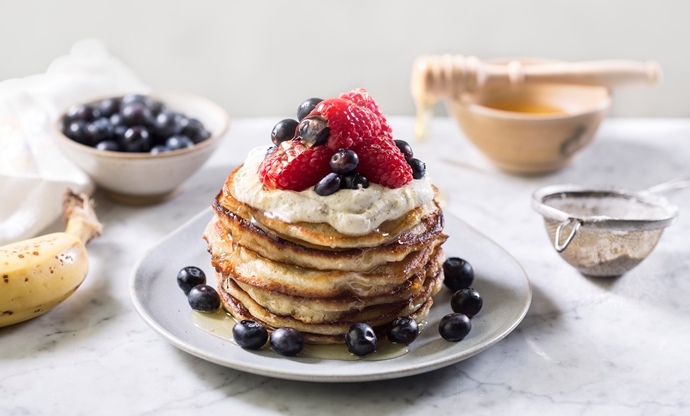 Once you’ve whisked everything together for the batter, they’re very quick to cook – just a couple of minutes each side will produce a pancake fit for any American diner. Porridge is one of those things that might not look incredible, but when cooked right it’s one of the most satisfying bowls of food you can get. 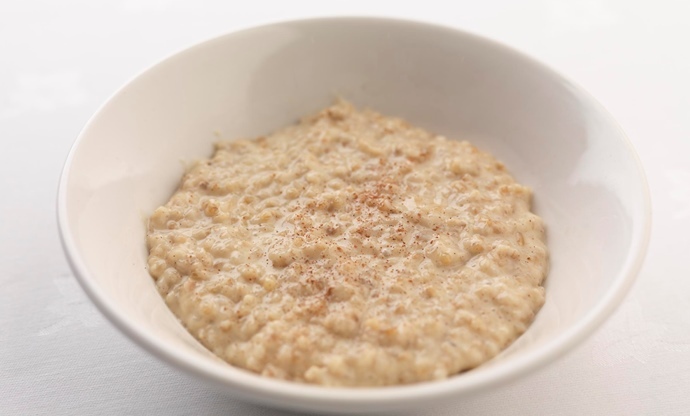 This recipe uses pinhead oatmeal as the simple base, and once you’ve soaked the oats overnight it’s just a case of cooking them with plenty of milk and butter, a little sugar, nutmeg and cinnamon, then finishing with a splash of double cream. Simple. 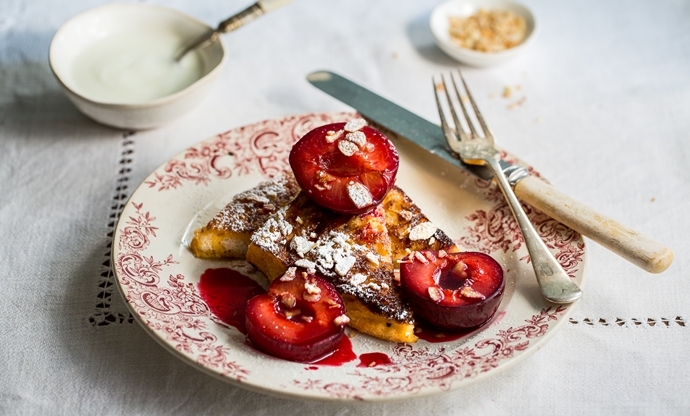 French toast is the best kind of toast – mostly because it’s dredged in milk, cream, sugar and eggs before being fried for an incredibly indulgent and delicious finish. Topping them with plums roast with a little brown sugar, cinnamon and star anise to bring out their inherent sweetness makes it even better. 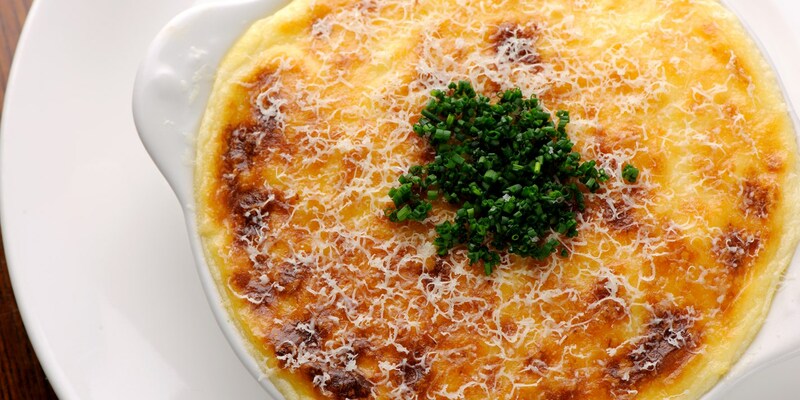 If your run-of-the-mill omelette just won’t cut it, then give this very rich and famous version a try. 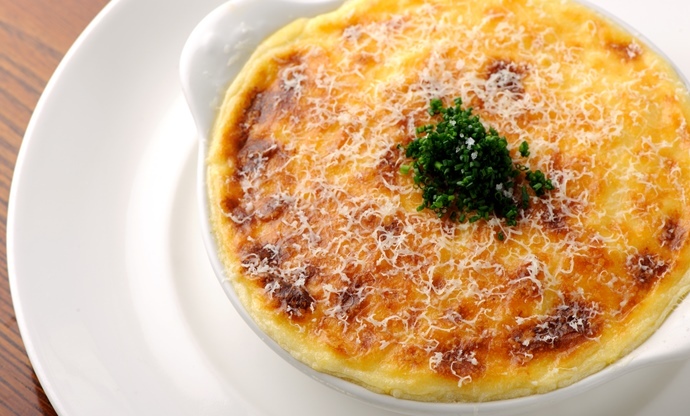 Combining smoked haddock, cheese and a béchamel sauce, this favourite of the English writer is perhaps a bit over-the-top for an average breakfast, but if you need to celebrate at the weekend it’s an ideal start to the day. Muffins are good at any time of the day, but in the morning they’re particularly good – especially if you need to eat on the move. 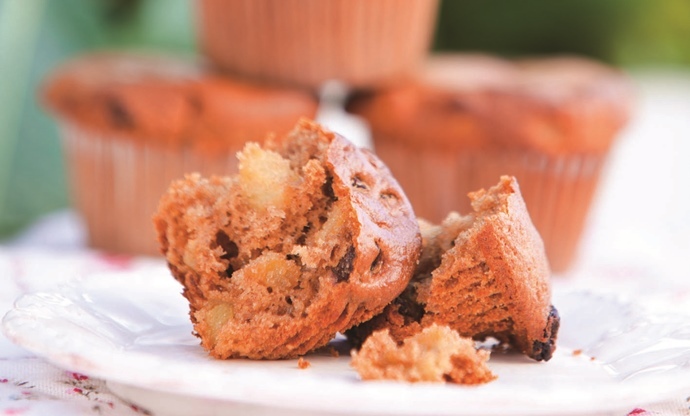 These apple muffins are lightly spiced with cinnamon, nutmeg and ginger, and can be baked the night before if you’re short on time. Just warm them up for a few minutes in the oven and you’re good to go. 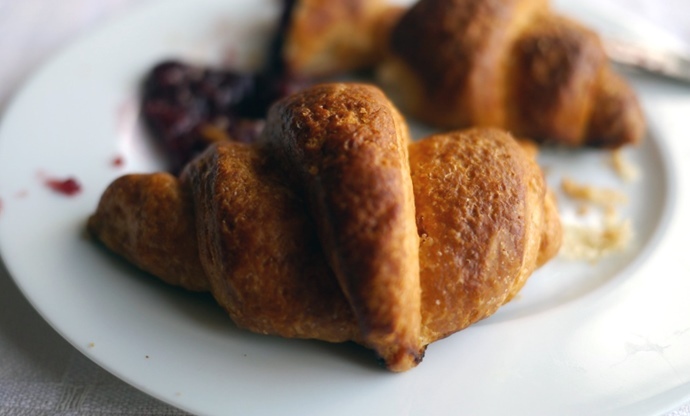 Everybody loves a croissant, but to actually make one yourself instead of relying on your nearest shop or bakery is an entirely different matter. All you need is milk, yeast, flour, salt, sugar, butter and water, plus a little time to roll and fold the dough to create that beautiful laminated effect, and they’re ready for baking. Prepare the dough the night before and let it rise and rest in the morning, before placing them in the oven and filling the kitchen with some of the most hypnotic aromas imaginable. 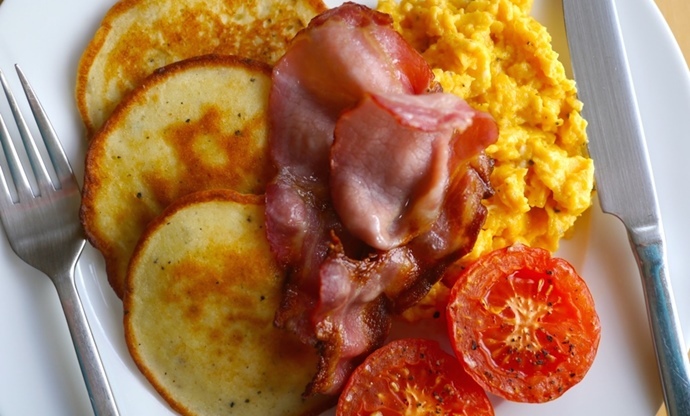 If you’re after something a little different to add to your full English and are avoiding gluten, these potato pancakes are the perfect solution. Make the batter the night before, giving it plenty of time to rest in the fridge, then heat up your frying pan and create a miniature stack to go alongside your bacon and eggs. They’re equally delicious served alongside smoked salmon or avocado as well, if you want to change things up a bit.